Facebook is challenging almost every other web company like Google through innovative ways. It has beefed up Facebook photo upload and sharing. It has spread to third party websites through Facebook like button. Now other websites can use Facebook commenting system instead of default commenting system to allow users to comment using their Facebook profile IDs. This for sure pose competition to existing commenting services like disqus and intense debate. Facebook commenting system is still new and is evolving with new features. Ideally, we share link of webpage to indicate our comment on that webpage. Now you can copy and share direct (permalink) of specific comment made by you or comment that you want to share for reference. 1. 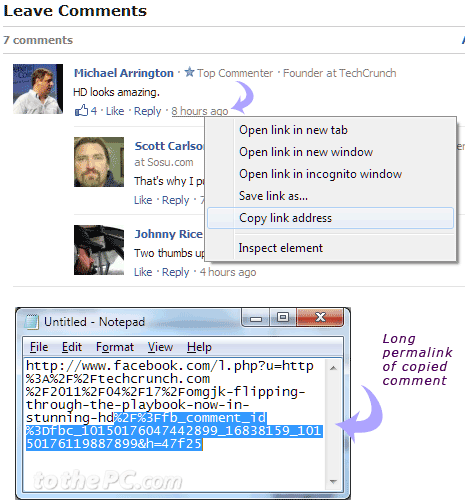 Open any webpage with comments and Facebook commenting system. For example: goto techcrunch.com and open any article with comments. 2. Then right click time field below specific comment and click copy (or copy link address) option. Direct permalink to specific comment will be copied. 3. You can paste and share the direct comment permalink with your buddies on Facebook, IM, Twitter or at other social networking websites – allowing them to directly view your comment, instead of having them browse all comments and waste time searching for your comment. This for sure is worthy addition to Facebook commenting system as pointed by Facebook Dev blog. Please note, permalink copy only work for direct comments and not for (replies) threaded comments. To highlight threaded comments, you need to copy permalink of the parent comment using above method. Is there any way to copy the link to an answer? The aim is to put this link in a single box to like. good blog and good content. I have learned more form it. Hope to keep update.